Carvana Co. is a holding company and not an operating company. Carvana Co. only holds 28% of the interest in the operating company. Class A common shareholders have less than 3% of the voting rights. More than 70% of the capital in the operating company is represented by non-floating units. The economic spin-off never happened since Carvana Group is still a client and supplier of Drivetime/Verde. Please note that this is a follow up to my first and second more general articles about Carvana Co. (NYSE:CVNA). I will write another article about Q4 numbers just before the release of Q1 earnings on May 8th. 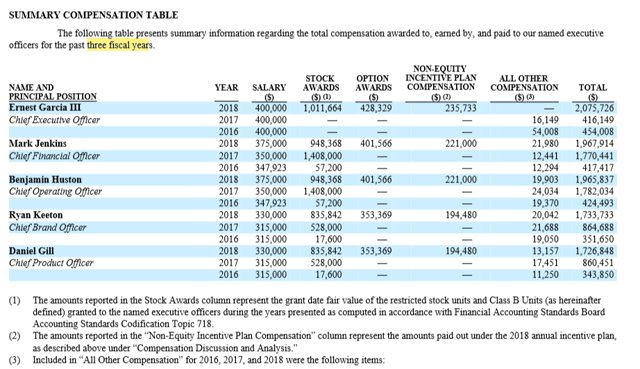 In this article, I want to focus on the structure of the Carvana companies, the low number of floating shares, the Tax Receivable Agreement, the close relationship to DriveTime and several other facts. Let us start with a graph published in CVNA IPO prospectus and republished in the yearly 10K. As you notice, the "Carvana Group" is composed of 4 companies. I will refer to "Carvana Companies" to avoid any confusion with Carvana Group, the operating company. The companies represented by a triangle are transparent companies from a tax point of view. As you can see, the only non-transparent company is CVNA, which is represented by a square. Carvana Co. is the listed company, meaning the company an investor becomes a shareholder of after purchasing the listed shares on the New York Stock Exchange (NYSE) under the symbol CVNA. We deduct that CVNA is only a holding company, because it just holds units in the operating company, does not hire any employees, does not own any assets (besides the participation in Carvana Group LLC and Carvana Sub) and does not engage in any contracts with suppliers. CVNA consolidates the financial results of the operating company, Carvana Group. Give this, we do not directly notice this fact by just analyzing the numbers in the quarterly and annual filings. 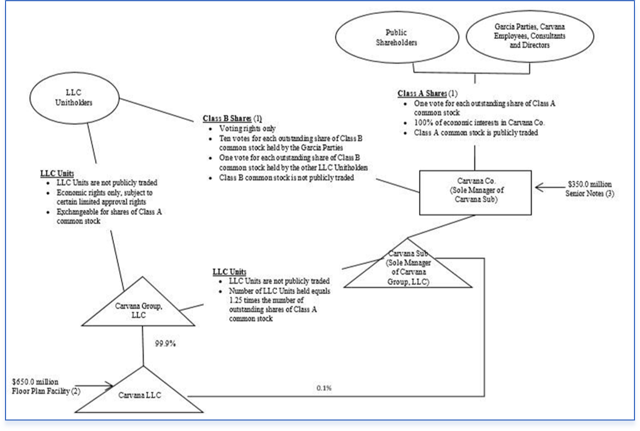 The structure as a holding company has two major effects on shareholders of Class A common share. CVNA is not a pure financial holding. In principle, the company has an active role in the management of the operating company, Carvana Group. In fact, CVNA owns 100% of the shares of Carvana Sub, the company that is the sole manager of the operating company. Carvana Sub, as the sole manager of CVNA, will be able to control all day to day business affairs and decision making without the approval of any other member unless otherwise stated in the LLC Operating Agreement. Is there the risk that Carvana Sub can be removed as a sole decision maker of the operating business? CVNA only holds 28% of the outstanding units in the operating company. What I mean by this is that the sole manager of the company is only a minority shareholder. The other 72% is owned by unit A holders. Those units are not publicly traded. The main holders of A units are the Garcia's. One might assume that a majority vote could remove Carvana Sub as a sole manager. The management of CVNA, mentioned in the IPO prospectus, is that Carvana Sub cannot under any circumstances be removed as the sole manager of the company. Indeed, the Carvana Group LLC company agreement mentions that Carvana Sub is the manager of the company, cannot be removed and that unitholders have no voting rights except where the Delaware Act requires them to vote. In this case, each unitholder will be deemed to have consented to or approved such action in accordance with the consent or approval of the manager. This last sentence seems a bit strange to me given that you force a person to consent to a future uncertain decision. However, given my lack of know-how of Delaware's corporate law, I will not comment further. At least, if things stay normal, there is little probability that Carvana Sub will be removed as a sole manager of the operating company. In practice, the weakness of those kinds of structures appears under stress, economic or legal difficulties. 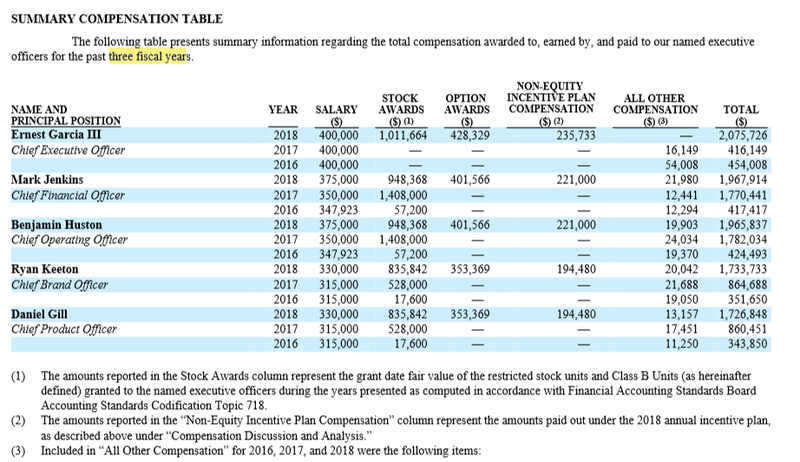 Therefore, we can conclude that CVNA is currently, through Carvana Sub, managing the operating company, even if CVNA is only a minority shareholder. However, what about CVNA in itself? Do Class A common shareholders have a say at the level of CVNA? Holders of not publicly tradable Class B shares have 98% of the voting rights in CVNA. Indeed, Class B shares have 10 times the voting rights of common A shares. In other words, Class A common shareholders currently have 2% of the voting rights. It is the Garcia's who decide, through their ownership, of class B shares, on all major decisions at the level of CVNA. These decisions include the appointment of management, payment of dividends and the incurrence of debt. Even if CVNA seems to have control of the operating company, CVNA Class A common shareholders have no decision power at the level of the listed company. Another important consequence is that the New York Stock Exchange (NYSE) considers the company as a "controlled company." Under this regime, the company might take advantage of less restrictive (less protective for the shareholder) rules. Reflecting on this, not only do the Garcia's have the decision power on all major points, but the company is even less controlled by independent directors. The risk of this holding structure is not only on the decision-making side but also on the Cash Flow side. CVNA, as a pure holding company, is not generating any Cash. However, it has to pay taxes and interests on the $350 million senior notes it emitted and used the proceeds of to buy class A units with. Furthermore, CVNA might be obliged to pay a high amount to the unitholder according to the Tax Receivable Agreement (see later in this article). The surviving of the holding depends purely on the distributions made by Carvana Group. In other words, if Carvana Group is not able to distribute enough cash, CVNA might have to file for bankruptcy without Carvana Group having to do so. In normal circumstances this might not be an issue; however, during a crisis, the most fit company will survive, and this will not be CVNA. As of December 31st, 2018, there were approximately 182.3 million Class A units and Class B units, respectively issued and outstanding. There is currently only around 40 million class A shares floating. This is the number of shares that are publicity tradable. The market value of these floating Class A shares is currently around $2.6 billion (as to say 40 million times $65 share price). Nevertheless, this represents only around 28% of the whole units emitted by the operating company. Therefore, the extrapolated value of the operating company is over $9 billion, even if the CVNA only has a market value of around $2.6 billion. Carvana Sub will be required to acquire several LLC Units equal to 1.25 times the number of shares of Class A Common Stock from Carvana Group. You can deduct from the following extract that unit A holders must decide about the increase in participation of CVNA in the operating company. In other words, they decide when CVNA must buy their units. Most of us acknowledge that the price of a good is, among other things, determined by offer and demand. In this case, the Garcia's have a major influence on the offer of the shares. Indeed, a higher offer has a negative influence on price. On the other hand, the longer the Garcia's wait, the higher the risk might be that they do not find more buyers at these prices. Only during the last three months, more than 5 million shares have been converted into common A shares. This represents a value of around $300 million. Can we conclude that the current market value of the operating company is the extrapolated $9 billion? I speak specifically of the market cap, if at least most of the shares have been traded at least once on public markets. In other words, there has been a proven demand for that quantity of shares at these price levels. In CVNA's case, only one-third of the potential shares are currently floating on the NYSE. Consider the hypothetical case of a company where the last price for the only traded share evaluates the company at $1 billion. However, the one share only represents 0.0001% of the capital of the company. Can we say that the company's market cap is $1 billion? Is this not by definition an oxymoron, meaning that not all the shares are in the market? As you can see in the table hereafter, the main shareholder of CVNA common A share is an investment Management company named Spruce House Investment Management LLC. On December 31st, 2018, Spruce House Investment Management LLC had among others following positions. There are several other reasons among tax, spin-off and liquidity that are important for CVNA class A common shareholders. First, regarding liquidity, this structure gives unit A holders (meaning shareholders before the IPO) the possibility to sell their participation in a higher liquid market than Private Equity. Second, they can probably sell it higher than during a classical IPO where a higher percentage of early owners had to offer their shares during IPO (The IPO price was $15 per class A share). This IPO structure is not unusual when one shareholder has that much voting power on the level of the holding company and is by far the largest unit holder at the level of the operating company. Combine that with the fact that another family-owned business is a major supplier and client of the business. This is in my opinion at least unusual and increases the risk for class A common shareholders. A direct consequence of the low float is the very high short interest of over 60%. I believe that many speculators already got squeezed out during the last months. There exists no quantitative definition of a short squeeze, as far as I know. However, the short interest is only around 15% of all potential floating shares once all units have been converted. Nevertheless, as we mentioned before, the conversion of units into Class A common shares depends unilaterally on the unitholders. I can imagine that they have nothing against a short squeeze. We also mentioned before that it is mainly the Garcia's that are converting and selling Class A common shares on the open market almost daily. However, despite this increase in offer, the price of the Class A common stock increased by over 95% year to date. On the other hand, the percentage of floating shares increased by around 10%. The small numbers of floating shares, combined with the high short interest, can push this stock much higher. The 2008 VW short squeeze is a good example of how far a stock price can go above its "economic value." I recommend every speculator shorting a stock to read about the VW short squeeze initiated by Porsche, who at that time wanted to take over VW. This short squeeze had among others a prominent victim, Mr. Merckle, who committed suicide two months after. Many speculate that this huge loss was a major factor of the suicide. CVNA acknowledges in the 2019 10K that some business relationships with DriveTime may not be negotiated at arm's length. Consequently, certain historical costs may not accurately reflect future costs. This being because DriveTime no longer provides Carvana Group with such services or refuses to continue so at currently contracted prices. In 2014, Carvana and DriveTime entered into a lease agreement that governs Carvana Groups' access to and utilization of temporary storage, reconditioning centers, offices and parking spaces at various DriveTime inspection and reconditioning centers and retail facilities. Lease durations vary by location with terms expiring between 2021 and 2024. Under those agreements, Carvana Group pays a monthly rental fee related to its pro-rate utilization of space. During the year, total costs related to the lease agreements were about $8.8 million. 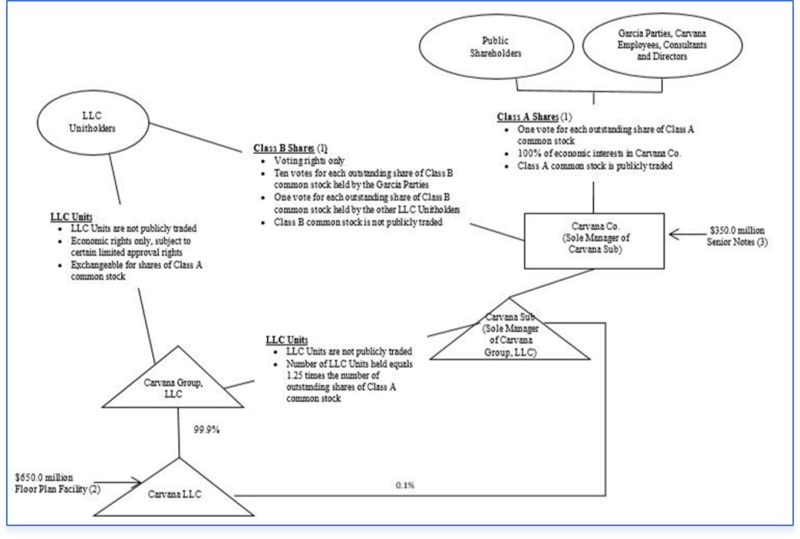 Those lease agreements are the essence of the Carvana Business Model and the family of the main counterparty has 98% of the voting rights in CVNA. How will this situation escalate in the event of business trouble? In December 2016, Carvana Group entered into a Master Dealer Agreement with DriveTime. Pursuant to this agreement, the company could sell Vehicle Service Contracts (VSC) to customers purchasing a vehicle from Carvana Group. DriveTime also administered a portion of the Carvana Groups Guaranteed Asset Protection waiver coverage for all clients under the Master Dealer Agreement. Carvana Group incurred approximately $2.2 million and $0.6 million in 2018 and 2017 respectively, related to the administration of GAP waiver coverage and limited warranty. In December 2016, the Carvana Group entered into an agreement in which finance receivables meeting certain criteria were sold to certain financial partners, mainly Ally Bank and Ally financials. Those financing partners engaged DriveTime as servicer of the receivables purchased under this agreement. During the year 2018, DriveTime aggregated earnings of $3.1 million pursuant to that agreement. During the year 2018, Carvana Group reimbursed $0.5 million for the usage of two aircrafts operated by DriveTime. This amount is relatively small and has no direct economic impact. However, it considers it as a symbolic number. As a shareholder, I would not like that management uses the plan of a supplier and client that might even be competitive in some markets. We can conclude that CVNA could not exist without DriveTime/Verde at this time. The economic spin-off never happened. This must not be a bad thing, so long as business is good. However, as investors, we must simulate future situations and I see trouble for shareholders if the business of CVNA would slow down. At that time, you will see which side the Garcia's are on, DriveTime, Carvana Group or CVNA. Furthermore, it is very difficult to come up with a value for the company because the quality and the quantity of these relationships is not determinable. Even for a very dedicated auditor, it might be difficult to control all these numbers. Another important fact regarding the participation of CVNA in Carvana Group is the Tax Receivable Agreement. As I stated before, the complexity of the structure is due to, among other things, tax reasons. Carvana group, the operating company, is a tax transparent company. The P/L are taxed at the level of the unitholders and not at the level of the company. By increasing its participation in the operating company, CVNA also increases its share of the tax basis in the net assets of this company due to the transparency. In the future, CVNA might benefit from lower taxes because of this structure. As you can read hereafter, the unitholders want 85% of the cash savings. Is this a fair deal? This is difficult to say. However, common shareholders did not have their say when it was made. What I do not like about the agreement is the following clause. As a former tax lawyer, I know about the high legal uncertainty in tax matters. Going off this clause, if such a tax decision is disallowed and forces CVNA to pay more taxes, this higher cost can only be netted against future payments. If the future payments are lower, CVNA cannot ask for payments back. In other words, unitholders have, at any moment, a guaranteed positive cash flow with respect to this tax receivable agreement. Finally, you can read hereafter, that the total Tax Agreement liability amounts to $110 million. Currently, the management judges it unlikely that the tax liability will become reality soon. As you can deduct from those two tables, the annual salaries seem to be conformed to general market practice. Consider all direct and indirect compensation and the realized stock awards. I consider the total payments high, especially in the context of a company that is losing a lot of money even if it is growing fast. However, this compensation can be unilaterally fixed by the Garcia's because of their high voting rights and the fact that the company is qualified as a controlled company by the NYSE. What is the purpose of this analysis? This nontransparent structure is not a necessary condition for shorting the stock. However, for me, it is a sufficient condition for not buying the stock even if the underlying business would match all my criteria. Why is this the case? First, an investor is investing in a holding structure. Even if the position of Carvana Sub as sole manager seems strong, this situation sure presents more risks than investing directly in the operating company. Furthermore, the holder of a common A share does not have the rights of a usual shareholder. Rights referring to approving the manager decisions during the yearly shareholder meeting, deciding on the appointment of new managers and having voting rights in major decisions regarding the company. This new form of shareholder might also be the case for other companies such as Facebook (FB). There is one more important fact in this case. Given that the company is a spin-off from DriveTime it still has a very close relationship to that company. However, the economic spin-off never happened. Concretely, Carvana Group is a client of DriveTime in its quality as a tenant of DriveTime's/Verde's offices and Inspection and Reconditioning Centers (IRC) and a client by using the airplanes of DriveTime. DriveTime is also a client of Carvana Group simply from paying Carvana Group a commission on the sale of VSC. Finally, less than one-third of the capital in Carvana Group is represented by publicly tradable shares. Given the relatively small number of outstanding shares, in addition to the fact that one person can increase the offer of shares at an arbitrary moment, makes an investment in CVNA also from a technical view quite risky. It is easier to push the price of a few stocks very high than to sell more stocks at that high price. Furthermore, increasing the offer of shares in a down market might become a vicious circle. Disclosure: I am/we are short CVNA. I wrote this article myself, and it expresses my own opinions. I am not receiving compensation for it (other than from Seeking Alpha). I have no business relationship with any company whose stock is mentioned in this article.